There is actually a Thunder game tonight. Woo-hoo!!!!!! Hello, Monday. Don’t be mean. Let’s Thunder Up with some DTR. Oklahoma City signed OKC native Rashawn Thomas to a partially-guaranteed contract. Its a process that can be both beautiful and scary all at the same time. A low pressure disturbance, which is basically winds that pick up water vapor, intensifying into something so massive and deadly is why mother nature reigns supreme on the respect scale. Usually these storms run their course, while keeping their impact to a minimum on the area they impact. But every once and a while, these behemoths can impact an area so severely, that the ramifications are felt, not only years later, but also in cities outside of the affected areas. 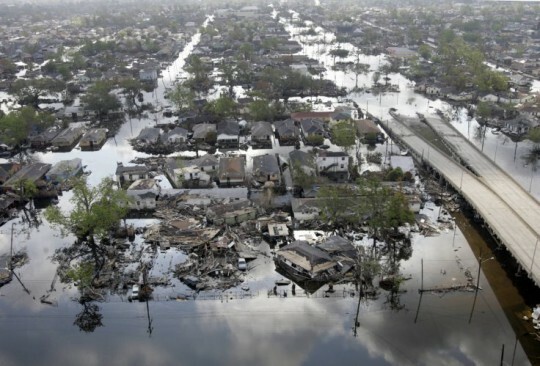 On August 29, 2005, Hurricane Katrina made landfall in Buras-Triumph, Louisiana, a city about 60 miles southeast of New Orleans. It struck land as a Category 3 hurricane after intensifying all the way to a Category 5 only 24 hours earlier. As with most hurricanes, the danger didn’t lie in the storm itself, but instead, on the amount of water that was dumped into the area. 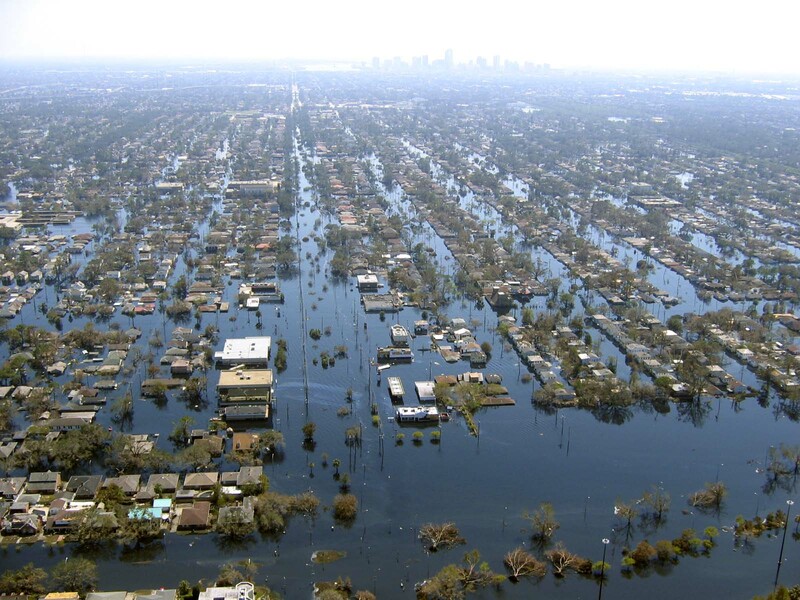 It is estimated that New Orleans received 8-10 inches of rain over a 4-5 hour period, while also receiving 12-14 foot storm surges from the Gulf of Mexico. That deadly combination of rain and storm surge overwhelmed the aging levee system, which caused it to completely fail. To make matters worse, the natural geography and topography of New Orleans is not very conducive to flooding. The city is already located below sea-level and is surrounded by huge bodies of water (Lake Borgne and the Mississippi River to the east, Lakes Maurepas and Pontchartrain to the north, and the Gulf of Mexico to the southeast). Once the storm passed through, the devastation become apparent. Over 80% of the city was completely flooded and infrastructure was almost non-existent. Bridges and highways were damaged. Hundreds were dead. Tens of thousands were displaced. The once great city was a shell of itself. As the shock and awe of the situation began to wear off, the reality of the monumental recovery/rebuild quickly shifted to the foreground. When infrastructure and lives are in jeopardy, sports gets understandably pushed down on the priority list. But the NFL and NBA needed to find contingency plans for the two teams in New Orleans. The NFL season was about 10 days away from beginning when the hurricane struck. Nearby metropolises with NFL-ready stadiums already had NFL teams, like the Houston Texans, Jacksonville Jaguars, and Kansas City Chiefs. Many other nearby cities didn’t have stadium capacity necessary for an NFL game. The Saints and the NFL chose San Antonio, Texas as the base for the Saints for the 2005 season, but the Saints only played 3 “home” games in the AlamoDome. Four other “home” games were played in Tiger Stadium in Baton Rouge, Louisiana and one other home game had to be shifted to Giants Stadium in East Rutherford, New Jersey. Because of all the limbo and travel, the Saints finished the season 3-13. Unlike the NFL, which only had days to work on their contingency plan, the NBA had at least a month to work on theirs. The biggest question was where the Hornets would be headquartered while the city was being repaired/rebuilt. If this article were a TV show, this would be where the show would feature a flashback. In the mid-90’s, now Oklahoma City Thunder majority owner Clay Bennett was one of the principal owners of the San Antonio Spurs. One of his main duties was to attend the Board of Governors meetings the NBA and its owner has at various points in the season. When that many powerful people are in one room, networking is one of the orders of the day. During those times, Bennett and then NBA commissioner David Stern developed a relationship that would come to affect Oklahoma City in years to come. When the NBA started in on their process to find a suitable temporary location for the Hornets, one of the first people to contact Stern was Bennett. The businessman who had roots in Oklahoma through marriage had already convinced the mayor Mick Cornett and other business leaders that this was the opportunity they had been waiting for by the time he made that call. It’s at this point where the show would flashback again. Ten years prior to the events in New Orleans, Oklahoma City suffered its own tragedy. The carnage created by the bombing at the Alfred P. Murrah Federal Building may not have been as widespread as the flooding in New Orleans, but it still affected the lives of many Oklahomans, even still to this day. The bombing became the catalyst to the improvement of downtown Oklahoma City. The City no longer wanted to be known as the “fly over city where the bombing occurred.” Instead, it wanted to compete with the likes of Dallas, Kansas City, and San Antonio in matters of tourism and culture. One of the things approved in the first MAPS (Metropolitan Area Projects Plan) was the construction of an 18,000+ seat multipurpose indoor sports arena which originally was known as the Ford Center. The Ford Center became the biggest selling point for Bennett in his quest to secure Oklahoma City as the temporary location for the Hornets. The 18,203 seat arena did not have a permanent tenant and was readily available for most any day the schedule called for. In addition, the business community stepped up to support the Hornets and cover a lot of the costs from the relocation. 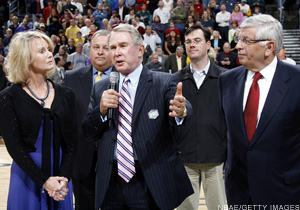 With all that in place, Stern and Hornets owner George Shinn made the decision to grant Oklahoma City the opportunity to temporarily house the Hornets for the 2005-06 season. While other cities may have been larger with more resources, such as Las Vegas or Kansas City, Oklahoma City offered no competition as far as pro sports goes and was ravenous in their pursuit to prove themselves on the big stage. And prove themselves they did. The city took to the team like a fish to water. It was the combination of a young fan base cheering for a young team. Oklahoma City was okay with just having a team, while the team was thrilled to have a crowd cheer for them. For five years prior to the move to Oklahoma City, the attendance for the Hornets had dwindled to about 14,110 people per game. They finished last or second to last in 3 of those 5 seasons, and were worst in attendance the season before Hurricane Katrina hit. The attendance in Oklahoma City averaged 18,168 as the Hornets went on to finish No. 11 in attendance in the league. The fans got to see Chris Paul’s rookie of the year campaign. They got to see the return of a hometown hero in Desmond Mason. They got to see one of the most vicious dunks ever when Kirk Snyder jumped over (yes, jumped over) Von Wafer for a dunk. They got to see the emergence of David West, who gave the fans three game-winning shots in that one season alone. They got to see a team that extolled many of the virtues they lived by; a team that many thought wouldn’t do well, but instead, stayed competitive throughout the season as they finished 38-44. Most importantly, the NBA decided to give OKC a second season, as the numbers in terms of population size weren’t yet where they wanted them to be in order to support two professional sports teams. The NBA knew that while the fan base for the Saints was strong, the fan base for the Hornets was not quite at that level. Instead of seeing an arena full of empty seats like they had before Katrina hit, the NBA decided to give New Orleans another year to recover, while also providing them some games in the Big Easy to whet their appetites. 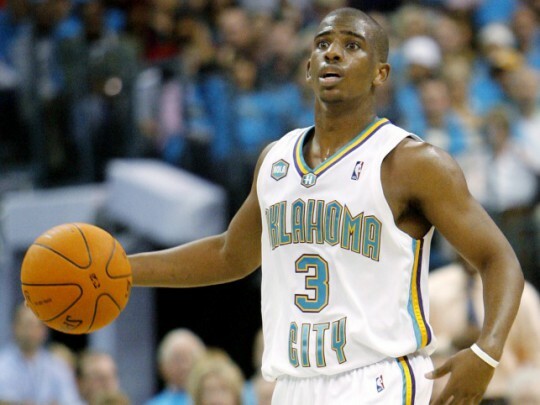 The 2006 offseason was the first offseason Oklahoma City ever got to experience, and it was a busy one at that. The team drafted 3 rookies (Hilton Armstrong, Cedric Simmons, and Marcus Vinicius), traded for Tyson Chandler, and signed Bobby Jackson and marquee free-agent Peja Stojakovic. While it was an exciting time to be an Oklahoma City Hornets fan, it was also starting to become bittersweet. When Stern and Shinn commented on the success of Oklahoma City as an NBA city, they always followed that up by stating they were fully committed to returning to New Orleans for the 2007-08 season. Being a Hornets fan in Oklahoma City began to feel like we were the committed mistress in a relationship that would be nothing more than a short-lived affair. The fan base loved their new team, but knew it belonged to someone else. In the background, though, Bennett was trying to buy majority ownership of the Hornets from Shinn. He would allow Shinn to remain with the organization as a minority owner, but wanted majority rule in decision making. 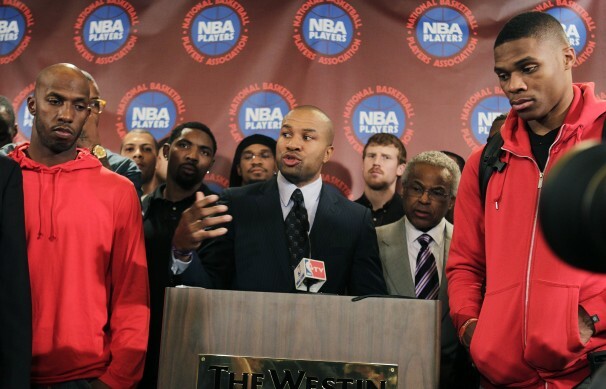 Shinn rejected the offer, citing the NBA’s desire to successfully return back to New Orleans. With that, Bennett set his sights on some other franchise to purchase. As the season started, the Hornets came out like gangbusters. They started the season 4-0 and got all the way to 8-3 before the wheels started falling off the bike. Injuries derailed the seasons of Stojakovic, Paul, West, Jackson, and Chandler. The Hornets continued to battle hard through the injuries, but were never able to put enough victories together to make any sort of impact, as they finished with the same record as the previous season. 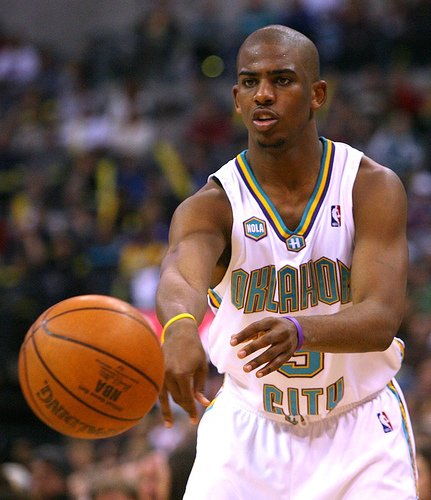 With that, the New Orleans/Oklahoma City Hornets once again became the New Orleans Hornets. While the hearts of many Oklahoma City fans were broken, there was another development happening in the Pacific Northwest. During the season, Bennett purchased the Seattle Supersonics from Starbucks magnate Howard Schultz. The move was likely backed by the league to get a ground swell of support for the construction of a newer, more profitable arena in the Seattle area. When the local owner couldn’t get it done, the NBA tried to bring in the new kid in the NBA circles to put pressure on the Washington legislature to get an arena deal done. Bennett went to Seattle and laid down his plan: he would try to get an arena deal done for that next season (07-08). If nothing was done by then, Bennett would pursue other options. A blind man could have seen from a mile away what Bennett meant by “other options”. With no arena deal in place, the wheels were already put in motion to try to get the Sonics to Oklahoma City. After a legal battle and about $100 million dollars in relocation fees and lease payments, the Seattle Supersonics officially became the Oklahoma City Thunder. Disaster begets opportunity. That’s just the way the cycle works. In a Utopian scenario, Katrina never happens, Seattle keeps their team, and Oklahoma City eventually (somehow?) gets an expansion franchise. But that’s not how it happened. Tragedy and disaster happened. Because of that, an opportunity arose. And the rest, as they say, is history. 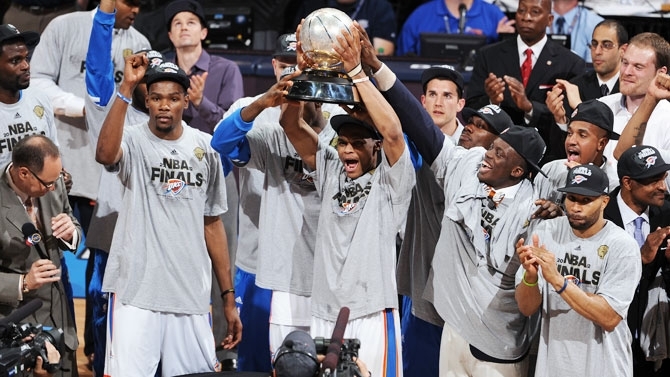 This past season, the Oklahoma City Thunder completed their 5th season in the state of Oklahoma. In a world dominated by round numbers, getting to the midway point is always a cause for celebration. In any relationship, you look back at key moments that made it possible to arrive at certain anniversary marks. In the next few months, I’ll be looking at 5 defining moments that made it possible for the Thunder to not only roar into the Plains, but also to do it in winning fashion. Those four words are probably the most important words ever uttered when it comes to professional basketball in the state of Oklahoma. Those words were mentioned in a conversation then NBA Commissioner David Stern had with then New Orleans Hornets owner George Shinn. The context of the conversation occurred shortly after Hurricane Katrina ravaged New Orleans in September of 2005. With much of the city destroyed and many of its citizens in exile to different parts of the country, the city of New Orleans was in no position to support either of their pro teams (the Hornets and the Saints). As Stern and Shinn were going to a list of contingency plans, Stern uttered those fateful words to Shinn. A lawyer by trade, Stern has always shown the chops to be prepared for any situation, and to be ready with a definitive solution. When he asked Shinn about Oklahoma City, it wasn’t asked as inquiry. It was asked as rhetoric. Stern knew what cities were hypothetically viable to support an NBA franchise in the short term. People tend to think the only thing needed to support a pro-sports franchise is population and a venue. But there’s so much more to the equation than that. Of course, you have to have the numbers (citizens). The more people in a given area, the more it is likely that 19,000 people will purchase tickets and attend games. You have to have an arena that is technologically up to date (availability of HD cables), and able to produce revenue outside of the NBA product (in-arena restaurants, kiosks, box seats, etc.). The city has to have a business community that is willing to take risks to cover the team’s operational costs if things don’t go as planned. And you have to have a fan base that is starved to support a professional team, no matter what the circumstances or parameters are. A few months before Katrina struck the Gulf Coast, then Oklahoma City mayor Mick Cornett made a trek to New York to discuss the possibilities of Oklahoma City someday being considered as an expansion or relocation site. He had a brand new state of the art arena and business leaders willing to assist with money and influence. 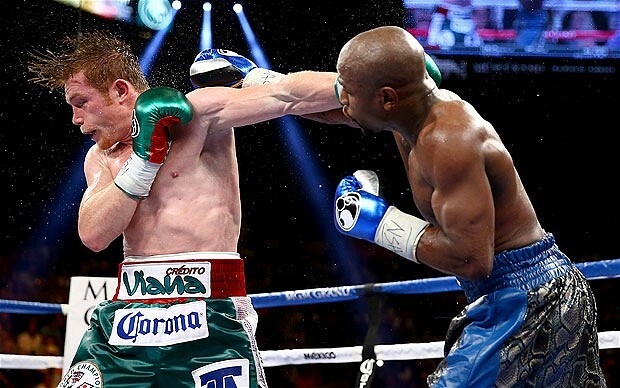 But as Cornett later quipped in an interview with Marc J. Spears of Yahoo Sports, “…the prometrics weren’t in our favor. We had no track record of major pro sports. Stern couldn’t have been kinder, but he left us with no hope for a team.” But alas, every garden starts with but a single seed. Stern, in his due diligence, probably heeded Cornett’s request and did some research of his own. 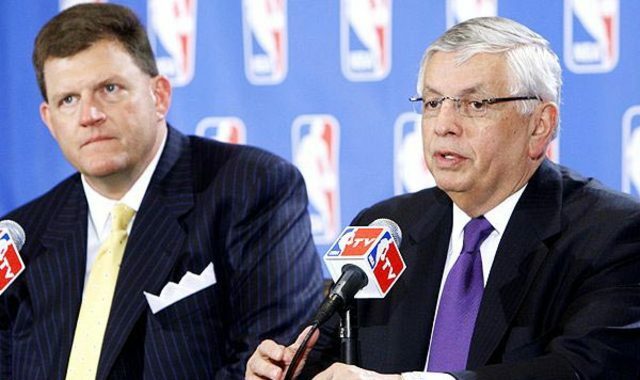 Some of the businessmen in the Oklahoma City area had previously had dealings with Stern and the NBA, so it wasn’t like OKC was a complete anomaly to the Commissioner. 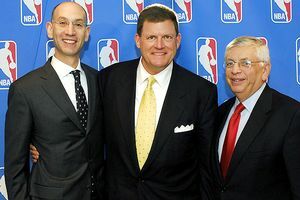 One of those businessmen was Clay Bennett, who once was a principal owner of the San Antonio Spurs in the 90’s and was the team’s representative at the NBA’s Board of Governors. Bennett probably kept the words Oklahoma City within an earshot of Stern every time they spoke. Even though the “prometrics weren’t in (OKC’s) favor” as Mayor Cornett stated, the fact that Oklahoma City was trying (MAPS I and II, Ford Center, downtown renovation), and was constantly being mentioned by associates of Stern probably kept the city in the back of Stern’s mind. So when Stern proposed that question to Shinn, he knew that he would be met with some opposition. As soon as you mention Oklahoma, most people outside of the region think of 3 things: The Dust Bowl, the musical, and the Murrah building bombing. A progressive city was probably not on the list of adjectives to describe Oklahoma City. But Stern had already done his research and knew that OKC already had most of the components in place to be a successful temporary relocation site. They had the venue, just enough citizens in the metro and surrounding areas, and the business leaders. All he needed to do was convince Shinn that this would be a viable relocation site. As is the case with the spirit of Oklahoma, when we are given a chance, we usually shine. When Cornett and Bennett made their presentation to Shinn, he was blown aback with the viability of this option. The business leaders of the City, led by Bennett, provided Shinn with a revenue guarantee. Basically, the business leaders would foot the bill if certain revenue goals were not met. With a new arena, the backing of the City’s business leaders and Stern, and not many other viable options, the decision was made to grant Oklahoma City 35 guaranteed home games for the 2005-06 NBA season. With that, OKC was welcomed into the professional sports brotherhood, even if it was only temporary. And Oklahomans voraciously ate it up. We had always wanted to eat at the big boy table, and now, from out of nowhere, this opportunity was bestowed upon us. Fans came in flocks to attend a New Orleans/Oklahoma City (NOK) Hornets game. The uncertainty of how long the team would stay kept some people from becoming too attached to the team. But even with that, the team sold out over half of its games that were played in Oklahoma City. The Hornets, who had finished last in attendance the previous season, went from averaging 14,221 fans to 18,168 fans, which was a 78% increase. With the revenue goals, not only met, but vastly exceeded, and New Orleans still in rebuild mode, the team and the NBA decided that Oklahoma City would get another season of Hornets basketball. With that increase in revenue, the team decided to trade for defensive center Tyson Chandler and sign sharp-shooter Peja Stojakovic to a near max contract. 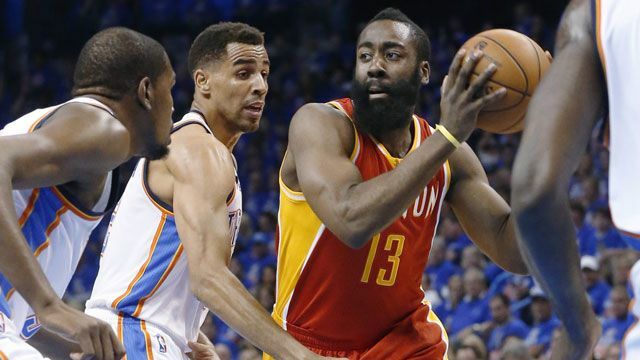 OKC would get 35 home games, while New Orleans would get the remaining 6 home games. Attendance started strong, with OKC selling out 6 of their first 10 home games. But when the word came that it was a certainty that the Hornets would return to New Orleans, attendance, understandably, waned a bit. But it was during that time frame, that another domino got put into place. 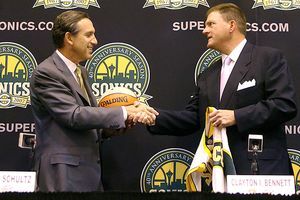 After failing to buy a majority stake of the Hornets from Shinn, Clay Bennett decided to set his sights on the Seattle Supersonics. The Sonics, and Stern for that matter, had been embroiled in a bitter dispute with the city over the viability of their venue, Key Arena. After putting the money up for the baseball stadium and the football stadium, the city was not in the mood to pay over $500 million to subsidize another arena. The team’s then owner Howard Schultz was losing money because of the team’s lease with the arena, and because of attendance issues. He sold the team to an outsider hoping that even the veiled threat of relocation would send the city into action to build a brand new arena. Instead, the city passed Initiative-91 which prohibited Seattle from supporting teams with city tax dollars. This initiative basically doomed any new stadium being built in the city of Seattle. Clay Bennett gave the city an ultimatum of 12 months to approve a plan for a new arena. When that time ran its course, he put in motion plans to move the team to Oklahoma City. He was met with opposition and litigation, but in the end, the city felt it would be better if Bennett payed a hefty sum to get out of the lease instead of waiting the lease out and getting nothing in return. Adam Silver took over for Stern as NBA Commissioner on February 1st, 2014. But much like the space between presidential election day and presidential inauguration day, the real Silver era doesn’t begin until after the All-Star break. This space in between from Feb 1st – 14th is more of a hybrid era where we praise the exiting commish and wonder what the new commish has in store. So in this hybrid period, I just wanted to say to Mr. Stern, “Thank you.” Thank you for giving Oklahoma City a chance at proving it’s worth as a pro-sports city. The process of OKC getting a team was a messy mixture of tragedy, finances, and politics. A lot like Marlon Brando’s character in The Godfather, Stern acted as an objective facilitator to Oklahoma City and helped us step into the world of professional sports.